I love it when ministers reference books I've read. 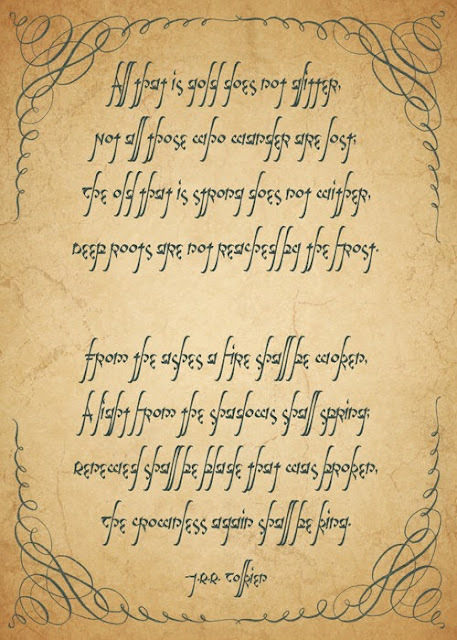 Today we had a guest minister who referenced "The Riddle of Strider" poem in Lord of the Rings. I remember the last lines being recited in the movie as the sword for Aragorn is re-forged, but I did not remember the whole of it in the book. The minister used the second line as his sermon title, "Not all Those Who Wander are Lost," and talked about how it resounds as true not only of Strider, who the hobbits did not know would become king, but of Paul and of Jesus and of the church in the world. He brought up the way the church is not viewed in society as an authority and does not "hold sway" the way it did, at least more than now, in the past. So, in a way, the church, which is "gold" is not glittering, and people may think the church is lost because they do not recognize its power. I struggle with acting out this kind of humility sometimes. I don't think I'm conceited, in so far as bragging about myself or my accomplishments, although certainly that happens, too. It's more that, especially when I am in a group, I like to be heard. I like to get what *I* want to say out there. When I'm feeling that way, I'm not "valu[ing] others above [myself]," right? I'm going to pray, and try to remind myself of this and improve. I'll try to be the gold that does not glitter.